MIM is the short for metal injection molding, it is a forming method in which the plasticized mixture of metal powder and its binder is injected into the mold. It is the shape required for mixing the selected powder and binder and then granulating the mixture for injection molding. 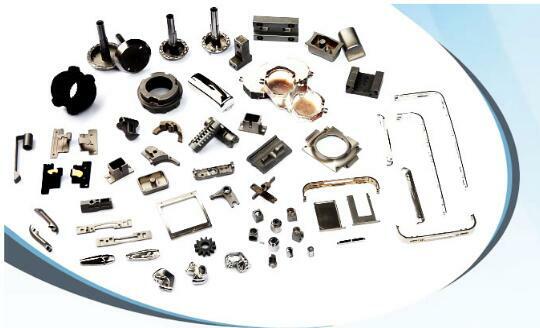 The MIM process is divided into four unique processing steps (mixing, molding, debinding and sintering) to realize the production of parts, according to the characteristics of the product to determine whether surface treatment is required. 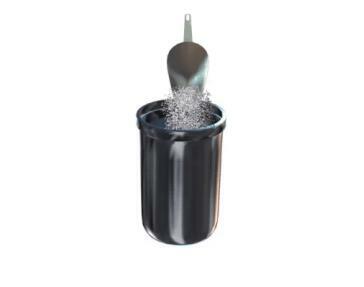 Fine metal powder and thermoplastic, paraffin binder is mixed in precise proportions. The mixing process is carried out in a special mixing equipment, heated to a certain temperature to melt the binder. In most cases, mechanical mixing is used until the metal powder particles are uniformly coated with a binder and cooled to form a pellet (called feed stock) that can be injected into the mold cavity. Injection molding equipment and technology are similar to plastic particles injection molding. The granular material is fed into the machine and heated and injected into the cavity under high pressure. This link is formed (green part) demoulding after cooling. The entire process can only be carried out by melting the binder (fully fused with the metal powder) at about 200℃. The mold can be designed as multiple cavities to increase productivity. The mold cavity dimension design should consider the shrinkage during sintering process of metal parts. The shrinkage of each material is accurate and known. Degreasing is the process of removing the binder from the forming part. This process is usually completed in several steps. Most of the binder is removed before sintering, and the remaining parts can support the parts into the sintering furnace. Degreasing can be accomplished in a variety of ways, and the most commonly used is solvent extraction. 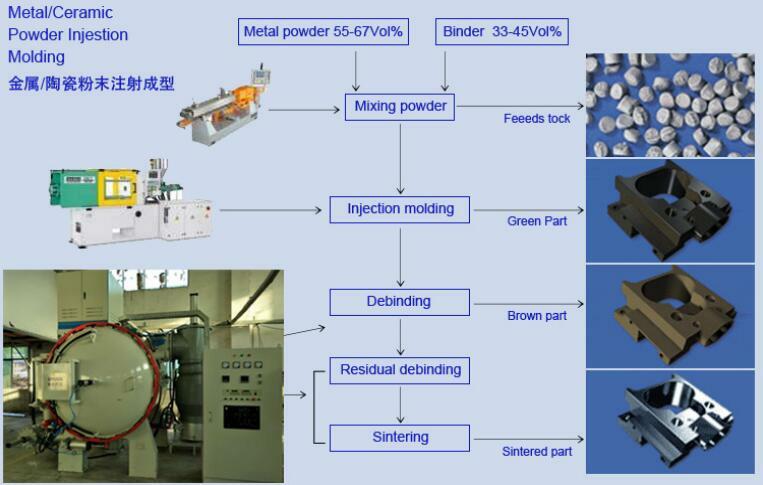 The degreased parts are semi-permeable, and the residual binder is easily volatilized during sintering. The degreased parts are placed in a high temperature, high-pressure furnace. The component is slowly heated under the protection of the gas to remove the remaining adhesive. After the binder is completely removed, the component is heated to a high temperature, and the space between the particles disappears due to the fusion of the particles.The component contracts to its design size and turns into a compact solid. For most materials, the typical sintering density is more than 97%. High sintering density makes product performance similar to forging material. According to specific requirements, some parts may require surface treatment after sintering. Heat treatment can improve metal physical properties. Electroplating and coating can be applied to high density materials. Provide brazing or cooling treatment technology. MIM is widely used in various automotive, medical, electronics, industrial, consumer and other industries, including auto parts, aerospace equipment, mobile phones, dental equipment, electronic radiator and sealed packing, electronic connector hardware, industrial tools, fiber optic connectors, spray systems, disk drives, medical devices, handheld power tools, surgical instruments, sports equipment and so on.